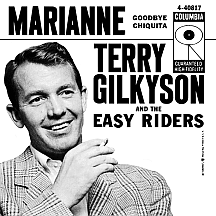 The catchy calypso tune "Marianne" has often been cited as the only hit for so-called "disappearing act" Terry Gilkyson and the Easy Riders. But I beg to differ! Gilkyson, with and without fellow Riders Rich Dehr and Frank Miller, built an impressive list of accomplishments both as a singer and a songwriter. Terry's career took off after writing and recording "The Cry of the Wild Goose," a Decca Records release in the fall of 1949. Frankie Laine had a huge hit with his pop cover in early 1950; the song captured a nation's imagination with its message of fly-away freedom. Laine and Gilkyson had a good thing going for awhile; Terry composed "The Girl in the Wood" (with Neal Stuart) as well as Frankie's hit duets with Jo Stafford ("Gambella (The Gamblin' Lady)" in '51) and "annoying" youngster Jimmy Boyd ("Tell Me a Story" in '53) in addition to Guy Mitchell's 1951 historical ditty "Christopher Columbus." The Phoenixville, Pennsylvania native didn't pursue a music career at first, instead working as a ranch hand in Arizona and New Mexico during the latter part of the 1930s. During this time he took up guitar and started writing folk songs, then served a tour of duty in the Army during World War II. Afterwards he moved to Los Angeles to chase his folk singing dream, purposely avoiding political overtones in the songs he composed in a play for a more stable kind of success (contrasting a separate trail being blazed by the great Woody Guthrie and a few other hardy souls). After his "Wild Goose" breakthrough, he had a dozen unsuccessful Decca single releases and one hit as featured vocalist on The Weavers' through-the-roof mid-'51 smash "On Top of Old Smoky." He took a stab at acting in the western film Slaughter Trail starring Brian Donlevy but confined his several film appearances over the next few years to singing parts with little or no obligation to recite lines of dialogue. In 1952, Terry formed a songwriting partnership with Dehr and Miller, who had been performing a short time as The Easy Riders. "Mister Tap Toe" by Doris Day was an early collaboration of the three. They reached the pinnacle with "Memories Are Made of This," a number one hit in early '56 for Dean Martin (the biggest ever for Jerry Lewis's straight man) featuring uncredited Easy Riders backing vocals. Columbia Records head honcho Miller Miller took notice and signed the trio to a contract. 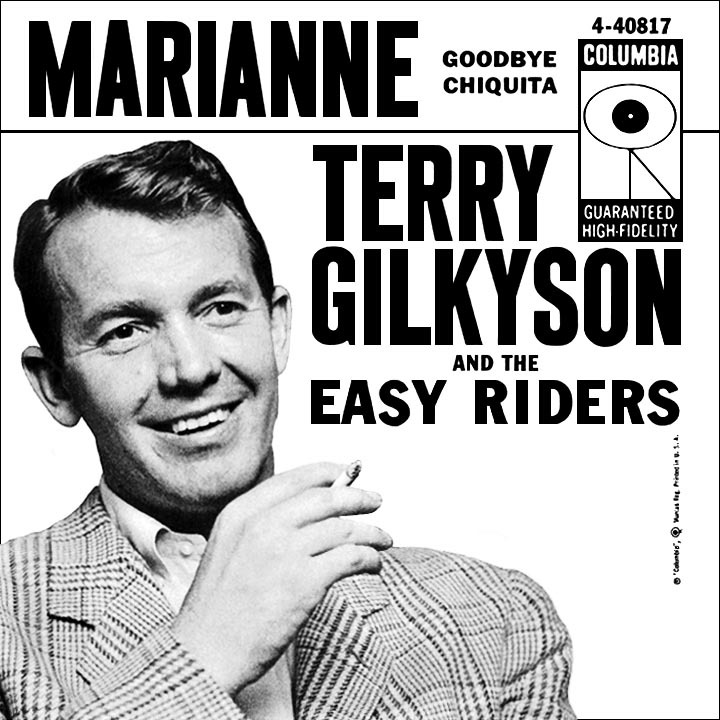 "Marianne," their second self-penned single for the company, put them on the map as Terry Gilkyson and the Easy Riders though Richard Dehr, not Terry, was the lead singer on the track. The easy singalong island tune ('All day, all night, Marianne...down by the seaside siftin' sand...') quickly became a standard; my introduction to it came a few years later as a favorite of my kindergarten class and I suspect it had a long run under similar circumstances in schools across America. The favorite line for many ('I will be so happy I will kiss me mother-in-law...PHOOEY!') anticipated a sentiment Ernie K-Doe tackled more candidly in 1961. The record zipped into the national top ten despite a bombardment by several competing versions; The Hilltoppers made the best go of it, rubbing shoulders in the top ten with the Riders' original in March '57 while versions by Burl Ives and The Lane Brothers had lesser chart runs. The title of the Riders' album release was straightforward: Marianne and Other Songs You'll Like. The trio teamed with Terry's old cohort Frankie Laine, backing him on "Love is a Golden Ring" and landing in the top 30 while "Marianne" was still riding high. They had established themselves as a popular folk act a year and a half before The Kingston Trio led the charge that made folk music a hot commodity. The group followed with "Tina," a fisherman's love song without the Caribbean accents, credited to The Easy Riders; for the next few years the group alternated billing, sometimes using Gilkyson's name in front, other times not. The record made a brief showing in May before their signature hit had ended its considerable run. "Strollin' Blues," a country blues shuffler on the flip side of "Tina," featured a lead vocal by Roberta Lee, a former big band singer Terry knew from his time with Decca (she had one small 1951 hit to her credit, a pop version of Pee Wee King's "Slow Poke"). There were no other hit records at Columbia, but the trio's songwriting skills remained strong. They supplied the theme for the 1958 documentary film Windjammer, a widescreen presentation touted as the first to use "Cinemiracle" (established as competition for Cinerama, it was also the last to use the similar process). "Greenfields" was by some accounts their most outstanding composition; Seattle-based folk act The Brothers Four made it one of 1960's biggest hits. By that time the Easy Riders had moved to the Kapp label and soon afterwards Gilkyson left, followed by Frank Miller. Rich Dehr kept the group going with various other members including Jerry Yester, who later had brief associations with The Modern Folk Quartet and The Lovin' Spoonful. Terry Gilkyson retired from singing, landing an enviable position composing music for the Walt Disney studio. His work was heard regularly on the TV series The Wonderful World of Disney and he composed memorable songs for several Disney films including "Thomasina," sung by Robbie Lester in the 1964 film The Three Lives of Thomasina and "The Bare Necessities," rendered by expert voice artist Phil Harris in the 1967 classic The Jungle Book, for which Gilkyson received an Oscar nomination for Best Song.